Click the little '...' button on your ship's info panel. Type in a name for your ship. Saved ship files are usually located in Documents\My Games\Cosmoteer\Saved Ships. WARNING: Ship save files are saved as literal PNG image files with a ".ship.png" extension. The actual data for the ship is stored in the image pixels. Do not resize, crop, or in any other way modify the contents of the PNG file; doing so will almost certainly destroy the ship data and prevent the ship from being loaded. (Renaming it is fine as long as you keep the ".ship.png" extension. You can also access this folder by clicking the '...' button in the top-right of the ship dialog and selecting "Open Folder". Start a new topic (in the Ship Designs sub-forum, please) or reply to an existing topic. Click the "Attach Image" button in the post window. Navigate to your Saved Ships directory (Documents\My Games\Cosmoteer\Saved Ships) and select a ship file to share. Wait a few seconds for the ship file to be uploaded to Imgur. Tell us what's cool about your ship and submit your post! WARNING: Imgur, the website that stores the ship files, will sometimes automatically convert them to JPEGs if they are too large, which corrupts the ship file and prevents the game from loading them. This mostly only seems to happen with ships that are much larger than the standard grid size. If this happens to you, create an account on Imgur and upload your file directly there while logged in to Imgur, then post a link to the file here on the forum. There are two ways to download another player's ship design that they've posted on this forum or anywhere else on the web. Right-click on the image of the ship and select "Save image as". Save the image into your Saved Ships directory (Documents\My Games\Cosmoteer\Saved Ships). Make sure you save it with a ".ship.png" extension; if it's just ".png" then Cosmoteer won't load it. The ship will now be available under "Saved Ships" in CreativeMode or to purchase in Standard Mode. Click, hold, and drag the image file directly from the web browser into Cosmoteer. After a few seconds, the ship should load and you should see its blueprints at your mouse cursor. Note that this ship still isn't "saved" to your computer. You'll need to explicitly save the ship design using the above method if you want to keep it. I can't find cosmoteer inside Roaming, and saved ships in cosmoteer. Is that normal or its just my computer? Try using the "open folder" option as described above. 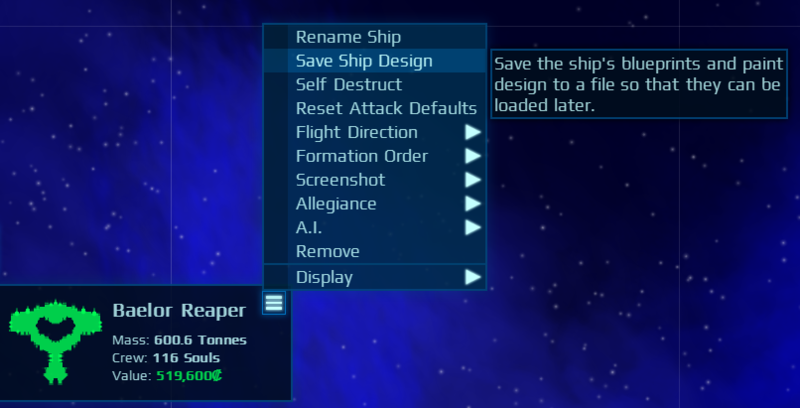 You have to click the ... button next to the X button in the "Save Ship Design" or "Load Ship Design" dialogs. Oh... Thank you, its working! It would be kind of nice if you could design a ship in your favorite paint program (or pixel art software) and import it into the game. This would make it possible to quickly design complex ships. Each block would represent a pixel(s) with a certain color. Make sure you have "Edit Blueprints" enabled like above. Awesome, I overlooked that one; I assumed it was the same PNG as the Ship Design. What if you resize convert each block to 2x2 and assign each block type and orientation a specific color. The decoration colors logo's could be done in a 2nd layer (or file). Laser (0 degrees rotated) = light green, Laser (45 degrees rotated) = darker green, Laser 90 degrees) = darkest green etc. Engine Type 1, Type 2, at each rotational direction a unique color. PS: I love this forum software! Arilou_Laleelay I assumed it was the same PNG as the Ship Design. Hmm, good point. I can understand how that might be confusing. I don't understand what you're suggesting here? My general instinct is that paint programs can be better for creating the overall shape of a ship, especially when you want the ship to have nice curves or other shapes that are hard to make with the tools in Cosmoteer. But in terms of specific part types, orientations, and doors, I'm not convinced that a paint program would provide a better interface for doing that detail work than Cosmoteer. I'm happy to be convinced otherwise, however! Arilou_Laleelay PS: I love this forum software! Yeah, it's the cleanest I've found, pretty modern feeling. It's still in development though, so it's got some missing features, like previews on new posts, and some bugs. Hey, I'm having trouble finding the Saved Ships Folder, although I did ask the downloader to put the files in a file I have for my own stuff (Shared computer). Any way to save my ships in different folder? or should I just wait until the next update hits and be more careful when I download it? I'll see if I can search directly for it. Thanks. The easiest way to find your ships folder is to click the little icon (with three horizontal bars) next to the X button in ship library. There is currently no way to change where ships are saved, but I'm planning to add that feature in the next major release. So, would I have to put ".ship" on the end of its name like the Model-(number/letter here)s? Or do I still put the ".ship.png"? SkipTheMercenary So, would I have to put ".ship" on the end of its name like the Model-(number/letter here)s? Or do I still put the ".ship.png"? Not exactly sure what you're asking. The filename should end with .ship.png, but when you save a ship in-game, it adds the .ship.png for you. Walt Ok, Yeah I got it working. I added the .ship to the end when I clicked "save image" and it added the .png for me. Thanks though!